The Nigerian Army yesterday inaugurated an investigative panel of inquiry to probe allegations by some Nigerians that its personnel were colluding with Fulani herdsmen in the killing of residents in Taraba and Benue states. At the event held at the Army Headquarters in Abuja, the Chief of Army Staff (COAS), Lt. Gen Tukur Buratai, said he was visibly disturbed at the allegations, especially coming from respected senior citizens of the country. Buratai charged the panel headed by Maj. Gen. Joseph Nimmyel (rtd) to go all out to unravel all circumstances leading to the allegations, vowing that personnel of the service found to have compromised in their services to the country would not be spared. The inauguration of the panel came barely three weeks after a former Chief of Army Staff, Lt. Gen. Theophilus Danjuma (rtd), raised the alarm that an ethnic cleansing was being executed in the country, especially in Benue and Taraba states, by Fulani militia in connivance with men of the Nigerian Armed Forces. He asked the people to rise up and defend themselves. 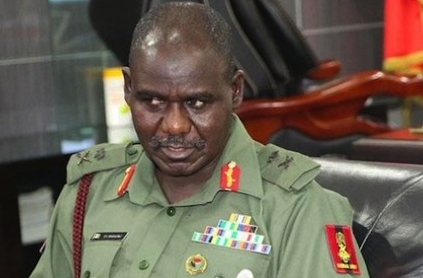 Buratai said the Nigerian Army had over the years conducted operations in line with its constitutional responsibility of defending the territorial integrity of Nigeria and providing aid to civil authority whenever it is called upon for such a task. According to him, the actions of the army in recent military operations, particularly in Taraba State, have been criticised by individuals and groups from across the country. “Some of these concerns have come from the state governments, non-governmental organisations and very senior citizens from the state. Most recently, on the 24th of March 2018, a former Chief of Army, Lt. Gen. Danjuma (rtd), speaking during the convocation ceremony of the Taraba State University, alleged that the armed forces colluded with armed bandits and other criminal elements. Buratai said members of the panel were carefully selected based on their proven record of integrity and meticulousness.